I’ve never done anything with gumpaste before. I know that it dries out VERY quickly, and that always made me shy away from it. I work very slowly, and the prospect of something drying quickly just seemed to add to the stress levels… but I thought I’d give gumpaste a chance. 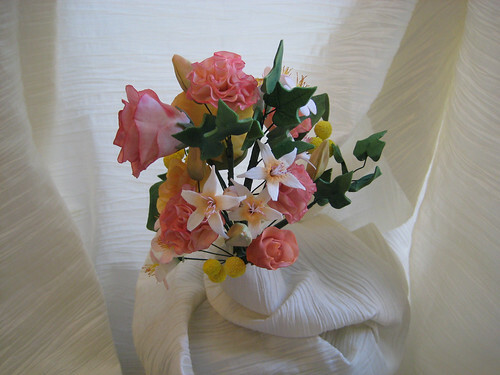 After all, I’m leaving for the Notter School of Pastry Arts on Sunday the 30th for a three-day course on cake decorating from Colette Peters. I’m very nervous, of course, but everyone keeps joking about how I’ve got to “Bring it!” and “Show those grannies up!” Truth be told, I wouldn’t have known about the Notter School if it weren’t for Su-Yin. She spent 6 months there doing the full pastry training, and I spent a full week reading all of her posts about the school and learning vicariously from her! Enough rambling. 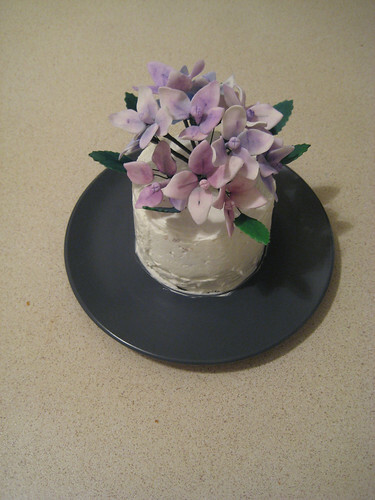 Here are some gumpaste flowers I attempted, not having a clue what I was doing. 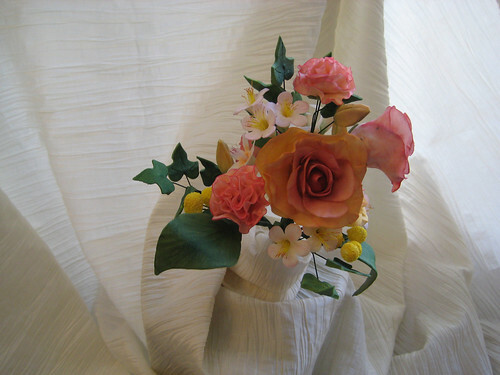 There are some roses, carnations, tulip buds, cherry blossoms, mimosas, azaleas, and ivy leaves. I will try to do more in the future, but these took me every night for a full week! Totally worth it. Please ignore the bad lighting…. I promise I’ll get some better lights later, when I can afford them….